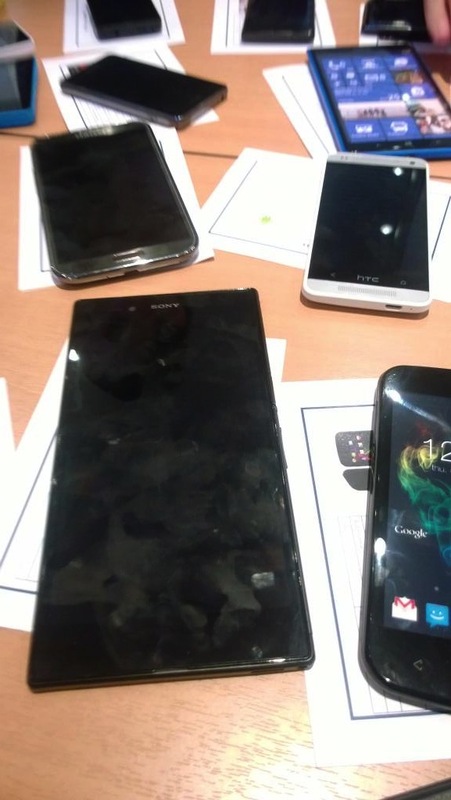 The above picture surfaced earlier today on Twitter, showing off some very interesting devices. Up first is the HTC M4 aka One Mini, a device that was leaked around the beginning of this month. This is the first time we are seeing it in person and the subtle differences between this phone and the larger One make it look like a very classy device. It has a white border around its edge, as well as having the smaller BoomSound grills. From the info that was leaked previously, it supposedly rocks a 4.3″ 720p display, 2GB of RAM, a dual-core Snapdragon processor and runs Android 4.2+. Next up is that huge Sony device. Being labeled as the rumored Togari device, this thing (pictured below the Galaxy Note 2) looks insanely large. It is rumored to feature a 6.44″ 1080p display and that is all that is currently known. Any thoughts on this Togari device or the One Mini?